McIvor Transit have submitted a proposal for contribution regarding service improvements for the Bendigo to Heathcote corridor. 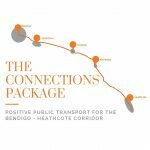 The proposed Connection Package prepared by McIvor Transit, has highlighted the need to improve frequency and days of operation along the Bendigo to Heathcote route, to benefit the Heathcote & Axedale communities, while complementing the proposed services for Junortoun. Please read the proposal attached for further information on the Connections Package. An invitation is extended to all members of the public to attend the 22nd Annual General Meeting of Heathcote Health to be held on Thursday 10th November 2016 at the Heathcote Senior Citizens Hall, High Street Heathcote commencing at 6pm. The Board of Management will present their report along with the Statement of Accounts of the Service for the year ended 30th June 2016. Years of service for staff and volunteers will also be formally acknowledged at this event. Mr Peter Wearne, Director of Youth Support & Advocacy Service (YSAS) will be the guest speaker for the evening. Mr Wearne has over 30 years’ experience in dealing with problems affecting young people, particularly those who are marginalised and has been with YSAS since its inception in 1997. Mr Wearne has a particular interest in working with police to improve their response to young people who have alcohol, drug and criminal behaviour issues – some of the same issues which affect Heathcote and the surrounding districts. Light refreshments will be provided. To confirm attendance for catering purposes. please call (03) 5431 0900. This month’s edition of Heathcote Health Matters focuses on stopping the stigma of mental health as well as the youth sexual services available to young people in the district. Click here to read more. Our Board Chair, Mr Wayne McKay, met with the delegate for the Secretary For Health & Human Services, Mr Adam Horsburgh last week to sign the 2016-17 Statement of Priorities. This document forms the formal funding agreement between the health service and the State Government. To review the Statement of Priorities for Heathcote Health in 2016-17, click here. Heathcote Health’s 2015-16 Annual Report of Operations and Financial Statements have been tabled in Parliament. Copies of the report will be made available at next month’s Annual General Meeting on 10/11/16 or from Heathcote Health’s reception. Click here to view the report online.